were located in Frog Hollow and Brush Creek. HUTCHISON, John of Frog Hollow, Albany area, Westfield.Twp, Fay.Co.IA. Burial: lima Cem, sec 3, Westfield.Twp, Fay.Co.IA. 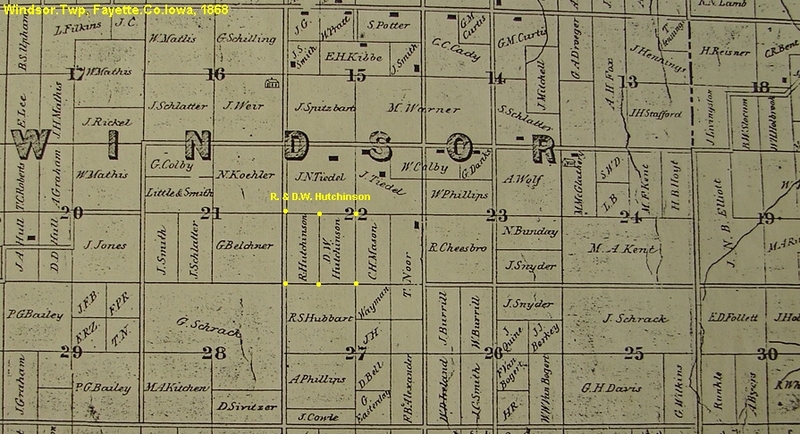 Note 6: 1856 Census; no Hutchison's enumerated in Westfield.Twp, Fay.Co.IA. Note 7: 1860 Census; sp Hutching, farming, $400/300, Frog Hollow, Westfield.Twp, Fay.Co.IA; parents with. Note 8: Jul 1860 John38, Mary26, John12, Elisa9, Geo5, Jane3, Frances1M, John55, Mary50. Note 9: 05 Sep 1863 Lima Cem officially started by John Hutchison& 7 other men. 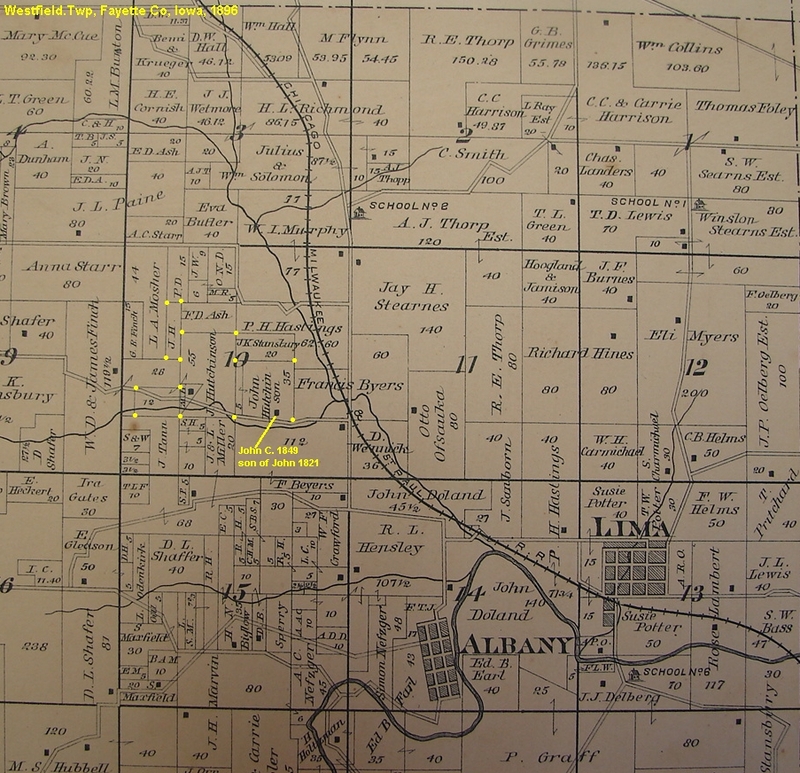 Note 10: 1870 Census; farming, $2k/673, Frog Hollow, Sec 10, Westfield.Twp, Fay.Co.IA; adj Andrew Hensley66. Note 11: 1870 John43, Mary44, JamesG12, Mary60. Note 13: 1878 Hist; farming, sec 10, Westfield.Twp, Fay.Co.IA. Note 14: 1880 Census; farming, Frog Hollow, Westfield.Twp, Fay.Co.IA; John53, Mary55, JamesG22. Note 16: Jun 1883 One of the six ring-leaders from Lima/Albany area of the lynching of Barber Brothers. Note 18: 1885 Census; farming, NW1/4ofSE1/4, sec 10, Westfield.Twp, Fay.Co.IA. Note 19: 1885 Farming in Frog Hollow, 59y, with wf Mary61, adj to son JamesG27 & JosEWroe34/PA. Note 21: 15 Sep 1888 FayettePaper; Notice, Spiritualistic Soc of Fay.Co, annual meeting, Wm. Odekirk farm,Center.Twp; John Hutchison. Note 22: 08 Aug 1891 Paper; 1st Religio-Philosphical Soc, meeting, J.Hutch.farm.sec, on Albany/Dunham Rd, AustinA Knight, Pres. 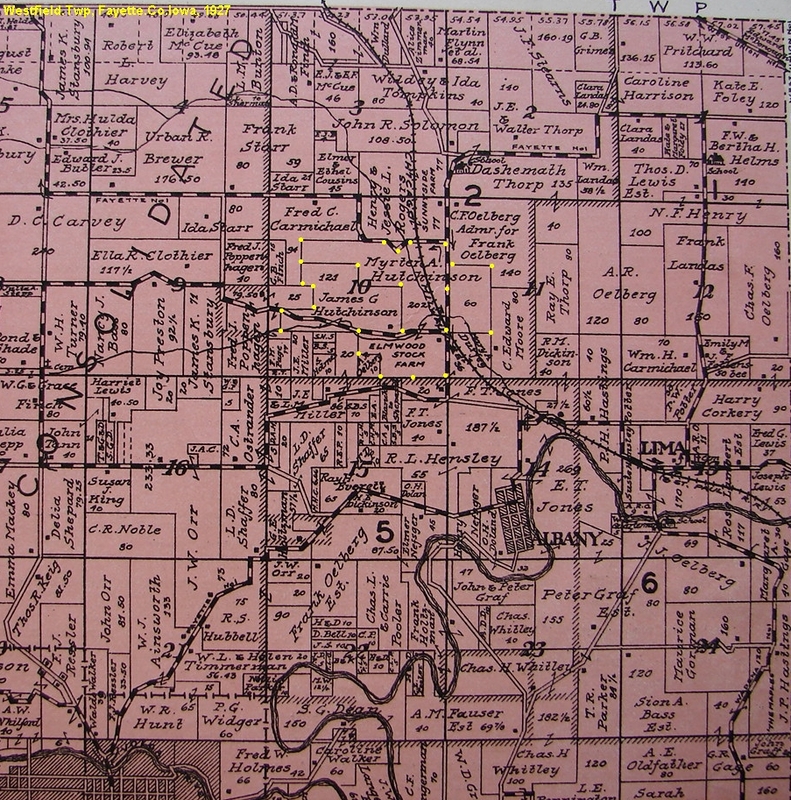 Note 24: 1895 Census; farming, 67y, Frog Hollow area, Westfield.Twp, Fay.Co.IA. Note 25: 09 Jan 1896 PostvillePaper; veteran slugger of abolition days, of famous Hutchisonfamily. Note 11: 1900 Census; widowed with son James, sec 10 farm, Westfield.Twp, Fay.Co.IA. 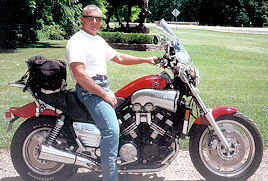 HUTCHISON, John Hamilton Hutchinson of Brush Creek (Arlington), Fairfield.Twp, Fay.Co.IA. Burial: Taylorville Cem, Fairfield.Twp, Fay.Co.IA. Note 3: Surname analogs; Hutchison, Hutchison. Note 4: Abt. 1849 Attended school in Scotland to age 11. Note 6: Bet. 1849 - 1856 Clerked at grocery in Scotland, learned business techniques. Note 8: 1856 Scotland to join bro. Wm. in MI, apprenticed wagon making. Note 9: Bet. 1856 - 1865 Learned carriage & wagon making. Bro. Wm's shop, Belleville, Wayne.Co, SE Mich. Note 10: 1865 MI to Fairfield Twp, Fay.Co.IA; to build house for Z.B. Allen. Note 11: Abt. Sep 1865 Opened wagon shop, Taylorville, Fairfield.Twp, Fay.Co.IA. Note 12: Bet. 1865 - 1875 Wagon shop in Taylorville, Fay.Co.IA. Note 13: 1875 Sold Taylorville wagon shop; built shop in Brush Creek (Arlington), Fay.Co.IA. Note 15: Bet. 1871 - 1877 Always well read; was studying law. Note 16: 1877 Admitted to the Bar & engaged as an Attorney. Note 17: Elected first mayor of Brush Creek. Note 18: 1878 Hist; Served ten yrs. as Brush Creek J.P. Note 19: 1880 Living in West Union, Fay.Co.IA, as Co. Recorder. Note 20: Remained a practicing lawyer in Brush Creek. 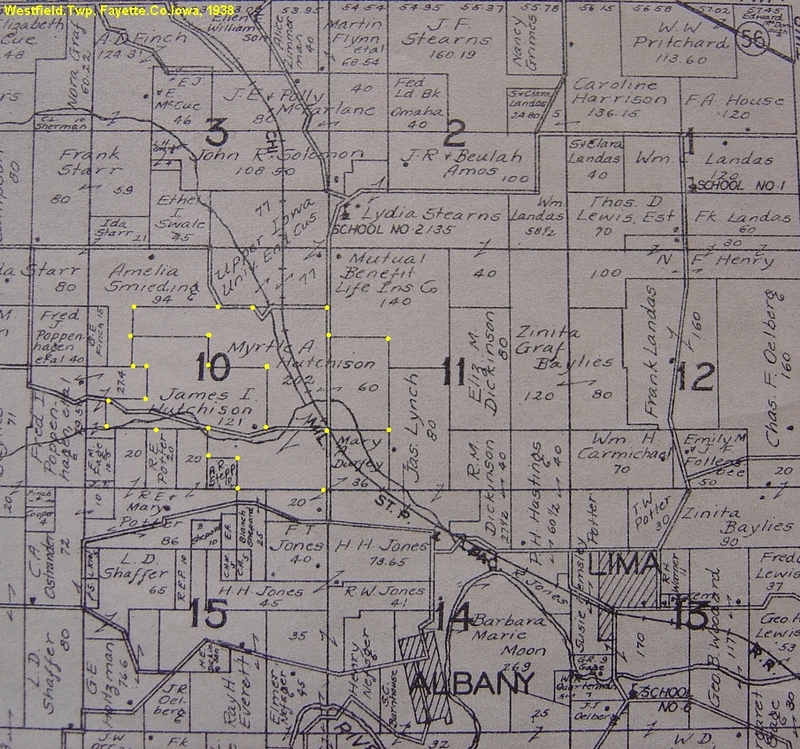 Note 21: 1879 Plat; 40 farm, 1m E of 6 corners, Brush Cr, NE corner, Sec 34, Fairfield.Twp, Fay.Co.IA. 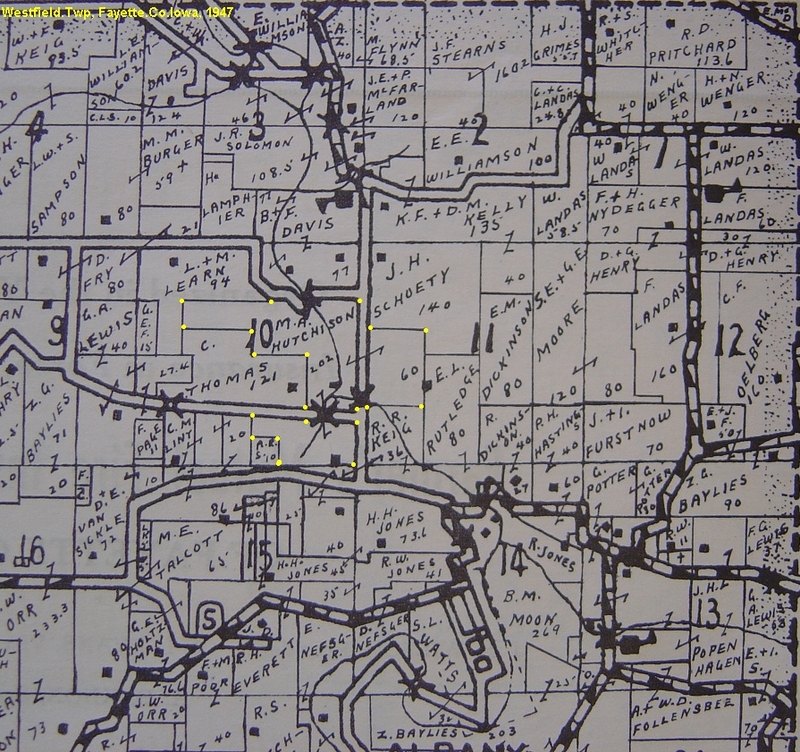 Note 24: 1896 Plat; 120, 1 3/8 mi E of 6 corner, Arlington, sec 34 & 35, Fairfield.Twp, Fay.Co.IA. b: 01 May 1841 in Belleville, Wayne.Co, SE Mich.
m: 14 Dec 1859 in Belleville, Wayne.Co, SE Mich.
that could not be tied into the two main families of Frog Hollow and Brush Creek. The other main John Hutchison line that lived at Arlington, Fairfield.Twp, Fayette.Co.IA follows the burial listing below. 1 HUTCHISON, John Hutchinson b: 1803 in Scotland d: 30 Jul 1875 in Sec 10, Westfield.Twp, Fay.Co.IA Burial: Lima Cem, sec 3, Westfield.Twp, Fay.Co, IA. Note 1: 20 Dec 2010 Hutchison last reviewed: Barry Zbornik Hannibal MO iowaz@hotmail.Com Note 3: Surname analogs; Hutchinson, Hutchison, Hutching. Note 6: 1856 Census; no Hutchison's enumerated in Westfield.Twp, Fay.Co.IA. Note 8: 1860 Census; sp Hutching55, wf Mary50, with son John's family, Albany area, Westfield.Twp, Fay.Co.IA. Note 11: 1870 Census; not enumerated, wife Mary with son John in Frog Hollow. 2 HUTCHISON, John b: 06 Jan 1821 in Scotland d: 20 Jul 1896 in Sec 10 farm, Westfield.Twp, Fay.Co.IA Burial: lima Cem, sec 3, Westfield.Twp, Fay.Co.IA. Note 6: 1856 Census; no Hutchison's enumerated in Westfield.Twp, Fay.Co.IA. 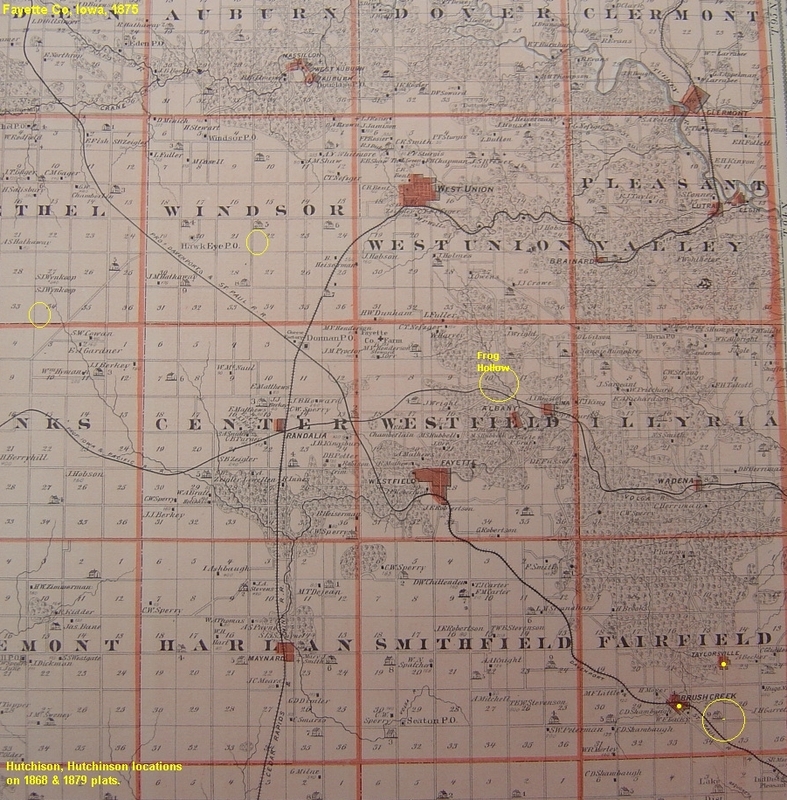 Note 7: 1860 Census; sp Hutching, farming, $400/300, Frog Hollow, Westfield.Twp, Fay.Co.IA; parents with. Note 8: Jul 1860 John38, Mary26, John12, Elisa9, Geo5, Jane3, Frances1M, John55, Mary50. Note 9: 05 Sep 1863 Lima Cem officially started by John Hutchison& 7 other men. Note 10: 1870 Census; farming, $2k/673, Frog Hollow, Sec 10, Westfield.Twp, Fay.Co.IA; adj Andrew Hensley66. Note 11: 1870 John43, Mary44, JamesG12, Mary60. Note 13: 1878 Hist; farming, sec 10, Westfield.Twp, Fay.Co.IA. Note 14: 1880 Census; farming, Frog Hollow, Westfield.Twp, Fay.Co.IA; John53, Mary55, JamesG22. Note 16: Jun 1883 One of the six ring-leaders from Lima/Albany area of the lynching of Barber Brothers. Note 18: 1885 Census; farming, NW1/4ofSE1/4, sec 10, Westfield.Twp, Fay.Co.IA. Note 19: 1885 Farming in Frog Hollow, 59y, with wf Mary61, adj to son JamesG27 & JosEWroe34/PA. Note 21: 15 Sep 1888 FayettePaper; Notice, Spiritualistic Soc of Fay.Co, annual meeting, Wm. Odekirk farm,Center.Twp; John Hutchison. Note 22: 08 Aug 1891 Paper; 1st Religio-Philosphical Soc, meeting, J.Hutch.farm.sec, on Albany/Dunham Rd, AustinA Knight, Pres. 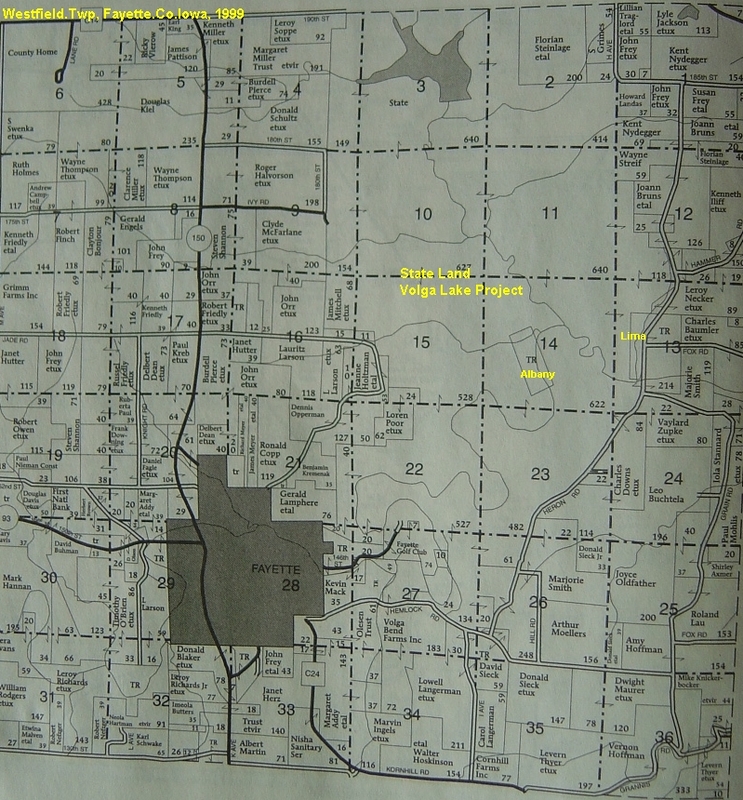 Note 24: 1895 Census; farming, 67y, Frog Hollow area, Westfield.Twp, Fay.Co.IA. Note 25: 09 Jan 1896 PostvillePaper; veteran slugger of abolition days, of famous Hutchisonfamily. ... +COOPER, Mary C. (suspect) b: Jan 1825 in Scotland d: 1905 in Westfield.Twp, Fay.Co.IA m: 1845 in Scotland Note 11: 1900 Census; widowed with son James, sec 10 farm, Westfield.Twp, Fay.Co.IA. 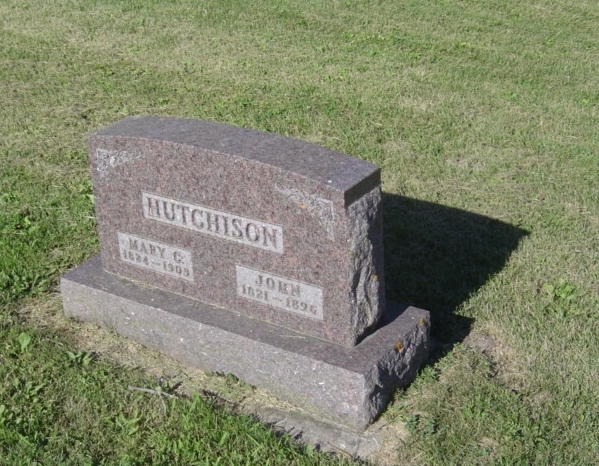 3 HUTCHINSON, John C. Hutchison b: 1849 in Scotland d: 07 Jul 1899 in Westfield.Twp, Fay.Co.IA. Burial: Lima Cem, sec 3, Westfield.Twp, Fay.Co.IA. Note 8: Hist; farming, sec 16, Westfield.Twp, Fay.Co.IA. Note 9: 1880 Census; farming. sec 16, Albany/Lima area, Westfield.Twp, Fay.Co.IA. Note 10: Mar 1880 JohnC31, Nancy32, Mary7, Alice7, Bertha3, Marion1. Note 15: May 1895 Paper; Living in Maynard area, Harlan.Twp, Fay.Co.IA. .... +UNKNOWN, Nancy E. b: 1848 in IN d: 1919 in Westfield.Twp, Fay.Co.IA. Burial: Lima Cem, unmarked, sec 3, reported by relative, Westfield.Twp, Fay.Co.IA. Note 4: Mother b. KY.
. 4 HUTCHINSON, Robert B. Hutchison b: 21 Jun 1871 in Sec 10, Westfield.Twp, Fay.Co.IA d: 01 Jun 1874 in Sec 10, Westfield.Twp, Fay.Co.IA Burial: Lima Cem, sec 3, Westfield.Twp, Fay.Co, IA. 3 HUTCHISON, Elizabeth Elisa S. b: May 1851 in Scotland d: 24 Nov 1865 in Sec 10, Westfield.Twp, Fay.Co.IA Burial: Lima Cem, sec 2, Westfield.Twp, Fay.Co.IA. 3 HUTCHISON, Thompson L. b: 03 Oct 1853 in Scotland d: 11 Feb 1861 in Sec 10, Westfield.Twp, Fay.Co.IA Burial: Lima Cem, Sec 3, Westfield.Twp, Fay.Co, IA. 3 HUTCHISON, George b: 1855 in Scotland d: in Sec 10, Westfield.Twp, Fay.Co.IA Burial: Lima Cem, sec 3, Westfield.Twp, Fay.Co, IA. 3 HUTCHINSON, James Greene b: 03 Nov 1857 in Sec 10, Westfield.Twp, Fay.Co.IA d: 01 Jan 1944 in Westfield.Twp, Fay.Co.IA. Burial: Lima Cem, sec 3, Westfield.Twp, Fay.Co.IA. 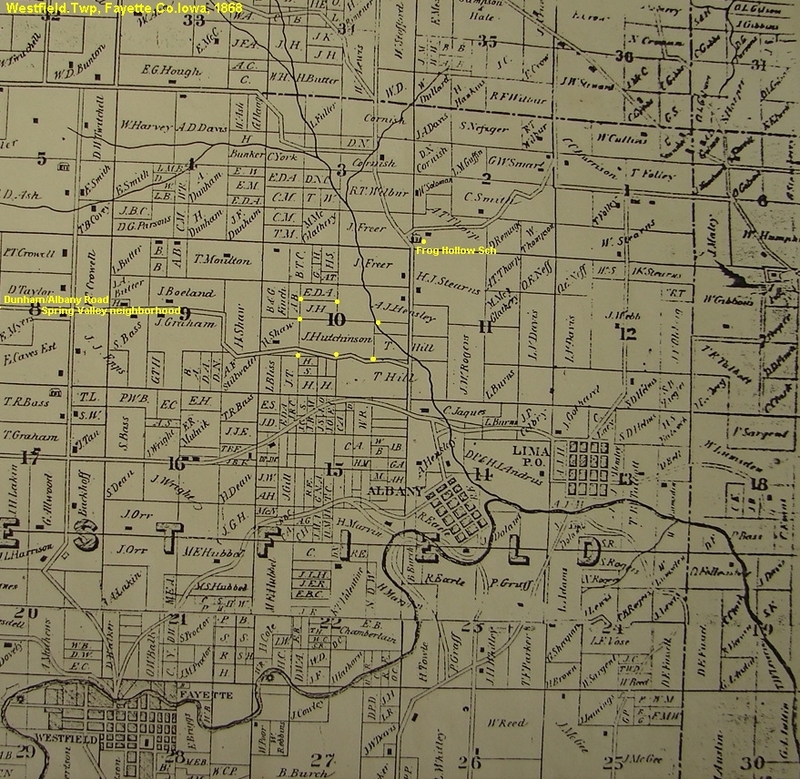 Note 8: 1885 Census; farming, NE1/4ofSW1/4, sec 10, Westfield.Twp,Fay.Co.IA; adj father John59 & JosEWroe34/PA. Note 9: 1885 Frog Hollow area, N of Albany, JamesG27, EvaK30OH, MartinA2, ChristnieE0 Note 11: Abt. 1890 Went to Dakota Territory, then returned to Fay.Co.IA by 1894 Note 12: Jul 1900 James42, Catherine45, Myrtisr17, James10, mother Mary75. Note 15: 1900 Census; farming, adj to Val Strayer, 2m SE of Fayette, Westfield.Twp, Fay.Co.IA. .... +FAUSER, Eva Catherine Katie b: 03 Jul 1854 in Bucyrus, Chatfield.Twp, Crawford Co, OH d: 28 Jan 1929 in Westfield.Twp, Fay.Co.IA. Burial: lima Cem, sec 3, Westfield.Twp, Fay.Co.IA. m: 12 Jul 1881 in Lima, Westfield.Twp, Fay.Co.IA Father: John Martin FAUSER Mother: Louisa Catherine KUNZE Note 6: 1880 Census, called Katie E.
. 4 HUTCHINSON, Merten Myrten Alexander Hutchison b: 29 Oct 1882 in Sec 10 farm, Westfield.Twp, Fay.Co.IA d: 25 May 1956 in Lima area, Westfield.Twp, Fay.Co.IA. Note 8: 1902 Attending UIU in Fayette, Fay.Co.IA. Note 11: 1925 Census; farming, Frog Hollow area, Westfield.Twp, Fay.Co.IA. 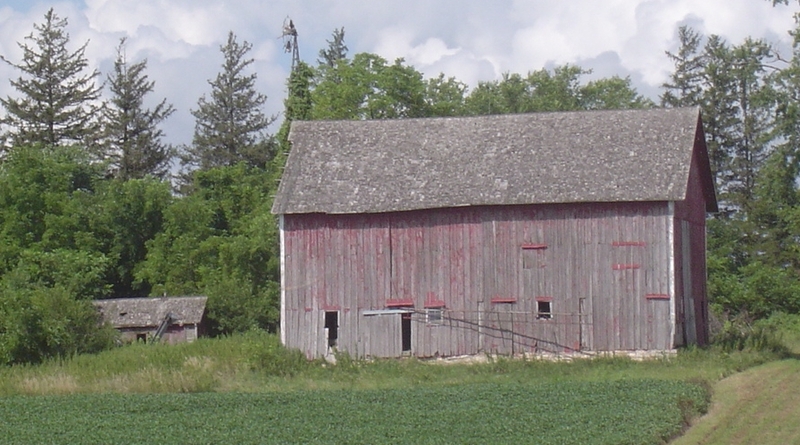 ... 5 HUTCHINSON, Jean Eleanor b: 1919 in Westfield.Twp, Fay.Co.IA. 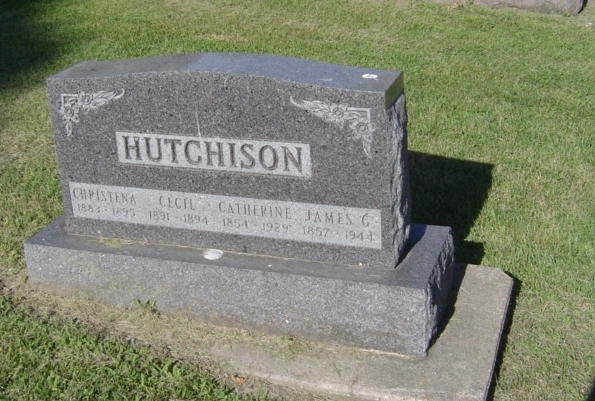 ... 5 HUTCHINSON, Mary Frances b: 1923 in Westfield.Twp, Fay.Co.IA.
. 4 HUTCHINSON, Christena Elizabeth Hutchison b: 01 Dec 1883 in Sec 10 farm, Westfield.Twp, Fay.Co.IA d: 03 May 1895 in Westfield.Twp, Fay.Co.IA. Burial: Lima Cem, sec 3, Westfield.Twp, Fay.Co.IA. ..... +HENRY, Leah S. b: Jan 1894 in NE d: 1973 in Fay.Co.IA Burial: Lima Cem, sec 2, Westfield.Twp, Fay.Co.IA m: 19 Mar 1915 in Spring Valley (3mi N of Fayette), Fay.Co.IA Father: Norman F. HENRY Mother: Laura N. SHEPARD Note 6: Bef. 1915 Clerk at Lima Store, Westfield.Twp, Fay.Co.IA.
. 4 HUTCHINSON, Cecil Elmer Hutchison b: 08 Sep 1891 in Wessington Springs, Jerauld.Co.SD d: 03 Jan 1894 in Westfield.Twp, Fay.Co.IA. Burial: Lima Cem, sec 3, Westfield.Twp, Fay.Co.IA. Hutchinson Catherine Eva Fauser Hutchinson James Greene 1857/MI-1944/Albany.IA Jul 3, 1854 Jan 28, 1929 Lima Cem Lima Sec 3. Dau of John Martin Fauser 1823/Germ-1880/Albany.IA & Louisa Catherine Kunze 1828/Germ-1904/Albany.IA. Ch; Myrten Alexander, Christena Eliz, James Ivan, Cecil Elmer. Hutchinson Cecil Elmer Hutchinson Hutchinson son of James Greene Sep 8, 1891 Jan 3, 1894 Lima Cem Lima Sec 3. Son of of James Greene Hutchinson 1857/MI-1944/Fay.Co.IA & Eva Chatherine Fauser 1854/OH-1929/Fay.Co.IA. Hutchinson Christena Elizabeth Hutchinson Hutchinson dau of James Greene Dec 1, 1883 May 3, 1895 Lima Cem Lima Sec 3. Dau of James Greene Hutchinson 1857/MI-1944/Fay.Co.IA & Eva Chatherine Fauser 1854/OH-1929/Fay.Co.IA. Hutchinson James Ivan Hutchinson Henry Leah S. 1894-1973, Westfield.Twp. Mar 31, 1890 dec 4, 1939 Lima Cem Lima Sec 2. Son of James Greene Hutchinson 1857-1944, Wesfield.Twp & Eva Catherine Fauser 1854/OH-1929/Westfield.Twp. 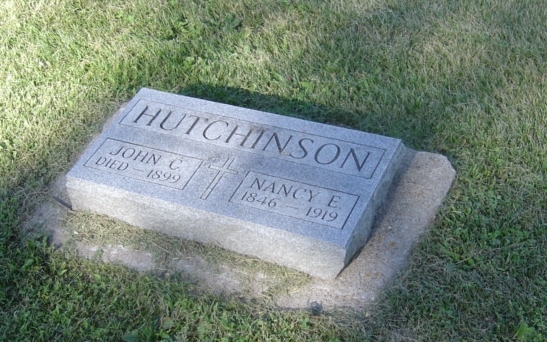 Hutchinson John C. Hutchinson Unknown Nancy E 1848/IN-1919/Westield.Twp 1849 Jul 7, 1899 Lima Cem Lima Sec 3. Son of John Hutchinson 1821/Scotland-1896/Westfield.Twp & Mary C. (? )Cooper 1825/Scotland-1905/Westfield.Twp. Robert B. Mary, Alice, Bertha, Marion. Hutchinson Nancy E Unknown Hutchinson John C. 1849/Scotland-1899/Westfield.Twp. 1846 1919 Lima Cem Lima Sec 3, from relative. Suspect unmarked, bz/2010. Need parentsl Ch; Mary, Alice, Marion, Bertha. Hutchison Alma Grace Mellem Hutchison Myrten Alexander 1882/Westfield.Twp-1956/Westfield.Twp Sep 10, 1888 Jan 8, 1958 Grandview Fayette Sec H. Dau of Myron Matthew Mellen 1846/OH-1913/Clatyon.Co.IA & Ida Lucinda Fenner 1853/NY-1918/Clayton.Co.IA. Ch; Jean Eleanor, Mary Francis. Hutchison Myrten Alexander Hutchison Mellen 1888/Clayton.Co.IA-1958/Westfield.Twp Oct 29, 1882 May 25, 1956 Grandview Fayette Sec H. Son of James Greene Hutchison 1857/MI-1944/Westfield.Twp & Eva Catherine Fauser 1854/OH-1929/Westfield.Twp. Ch; Jean Eleanor, Mary Francis. Hutchison Elizabeth Elisa S Hutchison Hutchinson dau of John1821 May 1851 24 Nov 1865 Lima Cem Lima Sec 2. Age 14y, 7m. Hutchison George Hutchison Hutchison son of John1821 1855 3? Feb 1861 Lima Cem Lima Sec 2. Age 6y, ?m, 13d. Son of John Hutchison 1821/Scotland-1896/Westfield.Twp & Mary C. ?Cooper 1825/Scotland-1905/Westfield.Twp. Hutchison George W Hutchison Hutchison son of John1821 No date 20 Nov 1851 Lima Cem Lima Sec 2. Age 1y10m11d. Son of John Hutchison 1821/Scotland-1896/Westfield.Twp & Mary C. ?Cooper 1825/Scotland-1905/Westfield.Twp. Error of death date? John1821 was still in Scotland until abt 1854/55. Hutchison James Greene Hutchison Fauser Eva Catherine 1854/OH-1929/Fay.Co.IA 1857 1944 Lima Cem Lima Sec 3. Son of John C. Hutchinson 1826/Scotland-1899/Westfield.Twp. Ch; Myrten Alexander, Christena Eliz, James Ivan, Cecil Elmer. 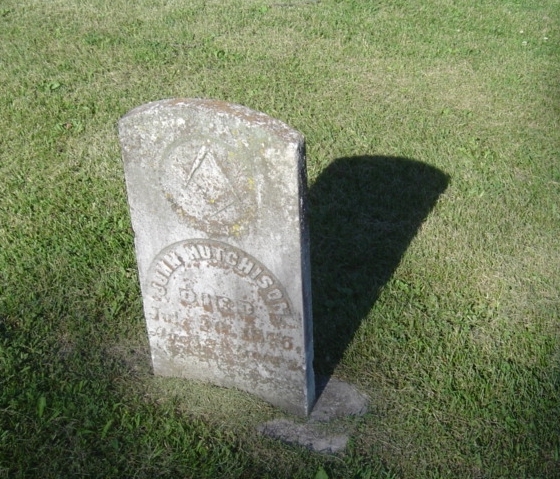 Hutchison John Hutchinson Unknown Mary abt 1903/Scotland-aft1870-Westfield.Twp 1803 30 Jul 1875 Lima Cem Lima Sec 3. Age 72y. Ch; John1821. Hutchison John Hutchinson Cooper (?) Mary C 1825/Scotland-1905/Westfield.Twp Jan 6, 1921 Jull 20, 1896 Lima Cem Lima Sec 3. Son of John Hutchinson 1803/Scotland-1875/Westfield.Twp & Mary Unknown 1810/Scotland-Ch; John C, Eliz S, Thompson L, Geo, James Greene, Frances, Wm. Hutchison Leah S. Henry Hutchinson James Irvan 1890/SD-1939/Fayette. IA Jan 1894 1973 Lima Cem Lima Sec 2. Dau of Norman F. Henry 1867/Frederika.IA-1963/Fay.Co.IA & Laura N., Shepard 1871/Lima.IA-1964/Fay.Co.IA. 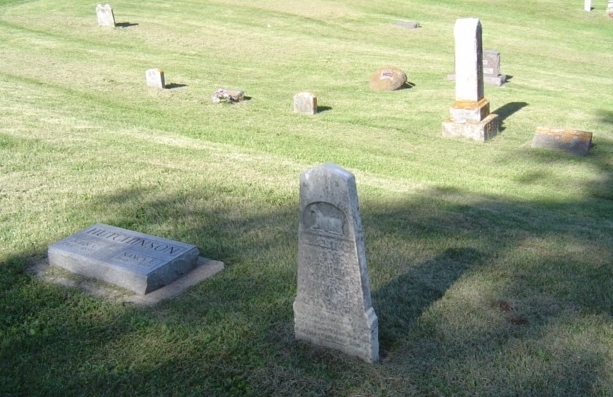 Hutchison Mary Unknown Hutchinson John 1803/Scotland-1875/Westfield.Twp abt 1803 aft 1870 Lima Cem Lima Sec 3. Suspected unmarked burial, bz/2010. Ch; John1821. Hutchison Mary C Cooper ? 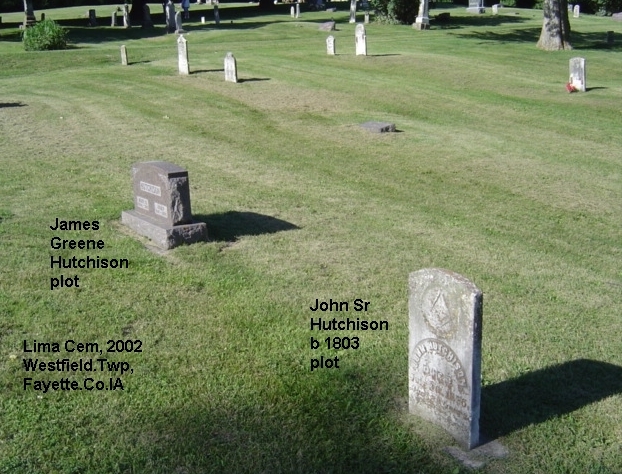 Hutchinson John 1821/Scotland-1896/Westfield.Twp Jan 1825 1905 Lima Cem Lima Sec 3. Need info. Ch; John C, Eliz S, Thompson L, Geo, James Greene, Frances, Wm. Hutchison Robert B Hutchinson Hutchinson son of JohnC1849 Jun 21, 1871 1 Jun 1874 Lima Cem Lima Sec 3. Age 2y11m11d. Son of John C. Hutchinson 1849/Scotland-1899/Westfield.Twp & Nancy E.(or B) Unknown 1848/IN-1919/Westfield.Twp. Hutchison Thompson L Hutchinson Hutchinson son of John1821 Oct 3, 1853 11 Feb 1861 Lima Cem Lima Sec 2. Age 7y4m8d. Son of John Hutchinson 1821/Scotland-1896/Westfield.Twp & Mary C. ?Cooper 1825/Scotland-1905/Westfield.Twp. Hutchison William Hutchinson Hutchinson son of John1821 Mar 29, 1862 19 Dec 1865 Lima Cem Lima Sec 2. Age 3?y 8m, 20d. Son of John Hutchison 1821/Scotland-1896/Westfield.Twp & Mary C. ?Cooper 1825/Scotland-1905/Westfield.Twp. Hutchison Annette Mayde Allen Hutchison Warren Edward 1884-1931, Arlington.IA Feb 7, 1887 Oct 1984 Taylorsville Fairfield Twp Dau of Elvin Dwight Allen 1860/Fairifeld.Twp-1932/Fay.Co.IA & Marquarite Rolfe 1861/Can-1941/Fay.Co.IA. Ch; John Zina, Edward A, Robert L, Bryon, Warren Richard, Margaret. Hutchison Byron Drake Hutchison Hatcher Gertrude I 1866/Hopkinton.IA-1914/Fairfield.Twp Aug 11, 1864 1945 Taylorsville Fairfield Twp John Hamilton Hutchison 1837/Scotland-1922/Arlington.IA & Martha Mary Lickiss 1841/MI-1929/Arlington.IA. Ch; Warren Edward, Harold Tracy. Hutchison Ethel W Unknown Hutchison Harold Tracy 1887/Arlington.IA-1964/Fay.Co.IA 1887 1967 Taylorsville Fairfield Twp Need parents & children. Hutchison Gertrude I. Hatcher Hutchison Byron Drake 8 Sep 1866 27 Apr 1914 Taylorsville Fairfield Twp Dau of James F. Hatcher 1833-1880 & Nancy A. Dennis 1836/?. Ch; Warren Edward, Harold Tracy. Hutchison Harold T Hutchison Unknown Ethel W 1887-1967, Fay.Co.IA 1886 1964 Taylorsville Fairfield Twp Son of Byron Drake Hutchison 1864-1945, Fairfield.Twp & Gertrude I. Hatcher 1866/Delaware.Co.IA-1914/Fairfield.Twp. Need children. Hutchison Helen L Unknown Hutchison 1913-1988, Arlington.IA 1913 No date Taylorsville Fairfield Twp Ch: John, Allen, Lynette. Need parents. Hutchison Warren Edward Warnie Hutchison Allen Annetta Maude 1887/MN-1984 1884 1931 Taylorsville Fairfield Twp Son of Byron Drake Hutchison 1864-1945, Fairfield.Twp & Gertrude I. Hatcher 1866/Delaware.Co.IA-1914/Fairfield.Twp. Ch; John Zina, Edward A, Robert L, Bryon, Warren Richard, Margaret. 2 HUTCHISON, William b: 1788 in Lasswade, Midlothian, Scotland d: 06 May 1860 in Lasswade, Midlothian, Scotland Note 5: Age at death; 73y. Note 6: Children; 13, with 11 reaching adult age, only John & Wm. came to America. ... +HAMILTON, Janet b: 1799 in Scotland d: 26 Mar 1877 in Edinburgh, Midlothian.Co.Scotland m: 17 Nov 1815 in Lasswade, Midlotiah, Scotland Father: Peter HAMILTON Mother: Jane MCGREGOR Note 5: Age at death; 84y. 3 HUTCHISON, William b: Bet. 1820 - 1830 in Midlothian, Scotland d: in Richland.Co.WI? Note 8: 1850 Scotland to Belleville, Wayne.Co, SE Mich, started wagon shop. Note 10: Bet. 1856 - 1865 Bro John joined from Scotland, taught carriage & wagon making, Belleville, Wayne.Co, SE Mich. Note 19: 1891 Wagon maker, Richalnd Center, Richland.Co.WI.
. 4 HUTCHISON, Jessie Note 8: 1891 Attorney in Richland.Co.WI. 3 HUTCHISON, John Hamilton Hutchinson b: 02 Jan 1837 in Lasswade, Midlothian, Scotland d: 28 Nov 1922 in Arlington, Fairfield.Twp, Fay.Co.IA Burial: Taylorville Cem, Fairfield.Twp, Fay.Co.IA. Note 3: Surname analogs; Hutchison, Hutchison. Note 4: Abt. 1849 Attended school in Scotland to age 11. Note 6: Bet. 1849 - 1856 Clerked at grocery in Scotland, learned business techniques. Note 8: 1856 Scotland to join bro. Wm. in MI, apprenticed wagon making. Note 9: Bet. 1856 - 1865 Learned carriage & wagon making. Bro. Wm's shop, Belleville, Wayne.Co, SE Mich. Note 10: 1865 MI to Fairfield Twp, Fay.Co.IA; to build house for Z.B. Allen. Note 11: Abt. 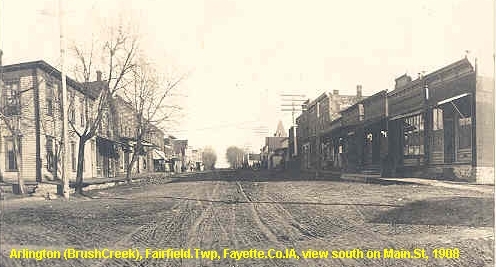 Sep 1865 Opened wagon shop, Taylorville, Fairfield.Twp, Fay.Co.IA. Note 12: Bet. 1865 - 1875 Wagon shop in Taylorville, Fay.Co.IA. 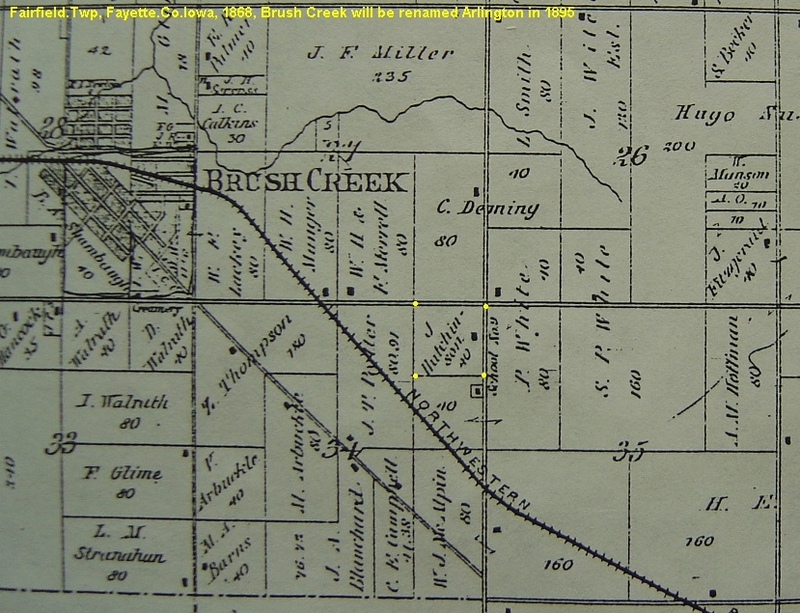 Note 13: 1875 Sold Taylorville wagon shop; built shop in Brush Creek (Arlington), Fay.Co.IA. Note 15: Bet. 1871 - 1877 Always well read; was studying law. Note 16: 1877 Admitted to the Bar & engaged as an Attorney. Note 17: Elected first mayor of Brush Creek. Note 18: 1878 Hist; Served ten yrs. as Brush Creek J.P. Note 19: 1880 Living in West Union, Fay.Co.IA, as Co. Recorder. Note 20: Remained a practicing lawyer in Brush Creek. 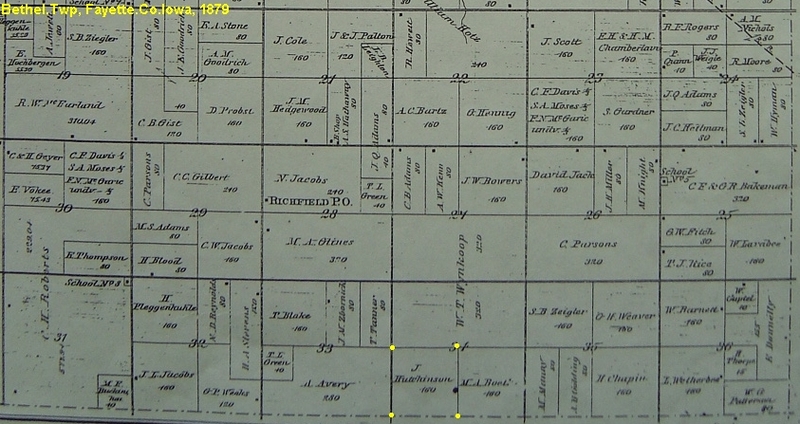 Note 21: 1879 Plat; 40 farm, 1m E of 6 corners, Brush Cr, NE corner, Sec 34, Fairfield.Twp, Fay.Co.IA. 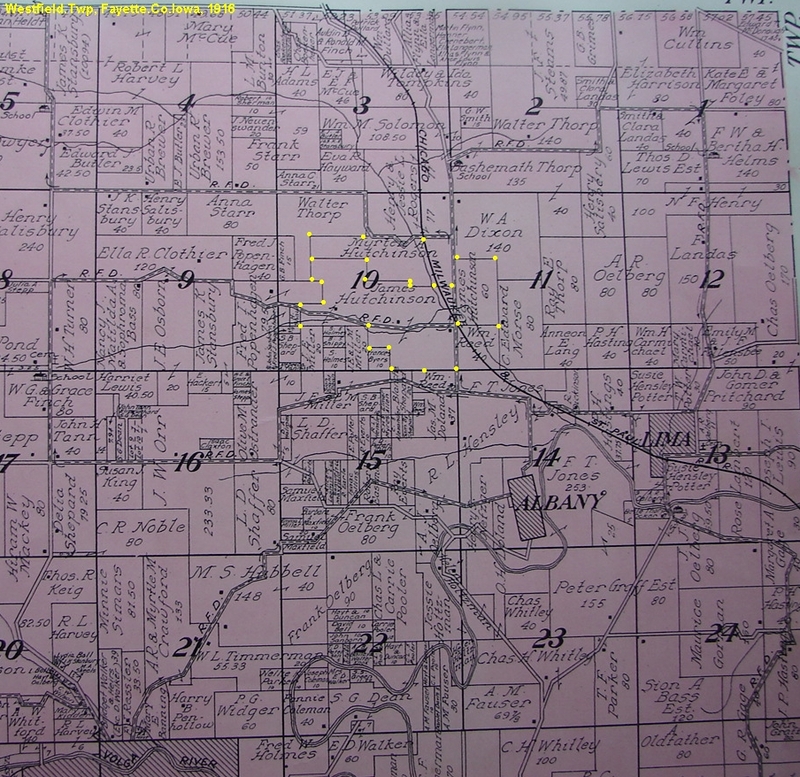 Note 24: 1896 Plat; 120, 1 3/8 mi E of 6 corner, Arlington, sec 34 & 35, Fairfield.Twp, Fay.Co.IA.
. 4 HUTCHISON, Minnetta Nettie Inez b: 08 Oct 1860 in Belleville, Wayne.Co, SE Mich. d: 02 Jul 1944 in Grand Island, NB Burial: Grand Island Cem, NB. Note 3: 1879 Married at parents home in West Union. Note 4: 1879 Fayette Co, IA, deputy recorder. ..... +THOMPSON, William Henry b: 14 Dec 1853 in Perryville, Perry.Twp, Carroll.Co.OH d: 06 Jun 1937 in Grand Island, Neb m: 07 Sep 1879 in West Union, Fayette Co, IA Father: Eli Isaac THOMPSON Mother: Eliza KIRBY Note 6: Bet. 1872 - 1874 Attended UIU at Fayette. Note 7: U. of Iowa Law School, Iowa City. Note 8: Bet. 1877 - 1881 Attorney at Brush Creek Fayette Co, IA. Note 9: Abt. 1881 Moved Grand Island, Hall.Co.NE, law partnership with brother John R. Note 13: Bet. 1919 - 1937 Involved in commission that erected Neb. Capitol. Note 14: Bet. 1924 - 1931 Neb Supreme Court Justice. Note 15: Bet. 1933 - 1934 Appointed, U.S. Senator from Nebraska Note 22: Info/text in notes section/report view. ... 5 THOMPSON, Edith Lyle b: 23 Aug 1880 in Brush Creek (Arlington), Fayette Co, IA d: 31 Aug 1904 in Grand Island Cem, Neb Burial: Grand Island Cem, NB; parents plot. Note 2: 1904 Living in Cedar Rapids, IA. Note 3: Died, parents home, was preganant or possibly in childbirth. Note 4: 1904 Went to visit paretns at time of death. ....... +PORTER, Wallace E. b: 1880 d: in Kansas City, MO Burial: Shrinner's Cem, KC? m: 08 May 1901 in Grand Island, NB Father: E. J. PORTER Mother: Unknown SEARS Note 3: English. Note 5: 1904 Traveling salesman, McClusky Reg. Co, later sales manager. Note 6: In Mason City at time of wife's death. .... 6  PORTER, Eugene Thompson b: 16 Nov 1902 Note 2: Stock broker Note 4: Divorced and remarried. Note 6: 1950 Residing, Portland, OR. .... 6 PORTER, Unknown b: 1904 d: 1904 Note 2: May not have been born when mother died. ... 5 THOMPSON, Martha b: 1884 in Grand Island, Neb d: 1884 in Grand Island, Neb Note 4: Called Mattie. ... 5 THOMPSON, Grover b: 03 May 1886 in Grand Island, Neb d: 1970 in Casper area, WY Note 4: 1907 Moved western NB. Settled on Sidney Divide, P.O. Leafdale. Note 5: Federal appraisor, Home Owner's Loan Corp, ten years, in Casper WY. 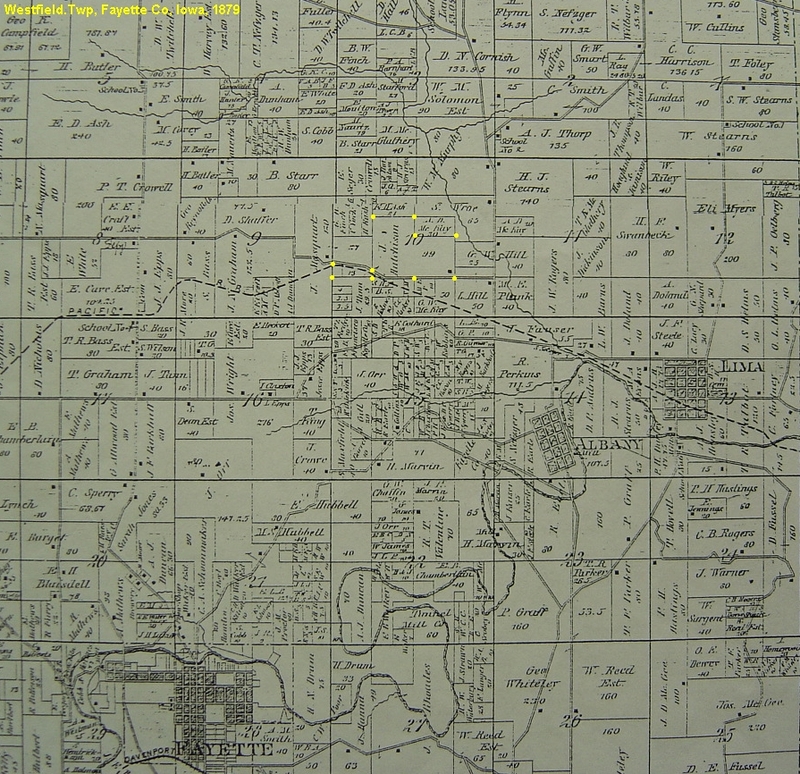 Note 6: 1913 Purchased 160a ranch near Glendo, WY. Note 8: 1950 Glendo ranch, grown to 4000a. Note 9: Would inherit grandfather Eli's farm. .... 6  THOMPSON, William b: 12 Dec 1908 in Sidney divide, western Neb Note 3: Owned a gas station. Note 4: Lived, Ft. Laramie, Wyoming Note 6: 1954 Resided at Thermopolis, WY. .... 6 THOMPSON, Otto b: 06 Aug 1912 in Sidney divide, western Neb d: 04 Mar 1935 in Glendo area, WY. Burial: Douglas, WY. ........ +HUGHES, Marie b: 1916 m: Jul 1930 Note 3: Second marriage, lived Boston, Mass. .... 6 THOMPSON, Grover Jr. b: 1923 in Casper area, WY Note 3: Army Air Corp, WWII. Note 4: Construction worker, rancher. Note 6: Took over WY ranch after parents death. ... 5 THOMPSON, Lloyd Garrison b: 25 Apr 1889 in Grand Island, Hall Co, Neb Note 5: Info from Hist.Hall.Co.Neb in notes section. Note 6: Practice law with father in Grand Island, Neb. Note 14: 1954 Resided, suburb, Miami, FL, real estate, investments. ..... +WALRATH, William Harrison b: 25 Apr 1854 in Oneidea Co, NY (or Fay.Co.IA?) 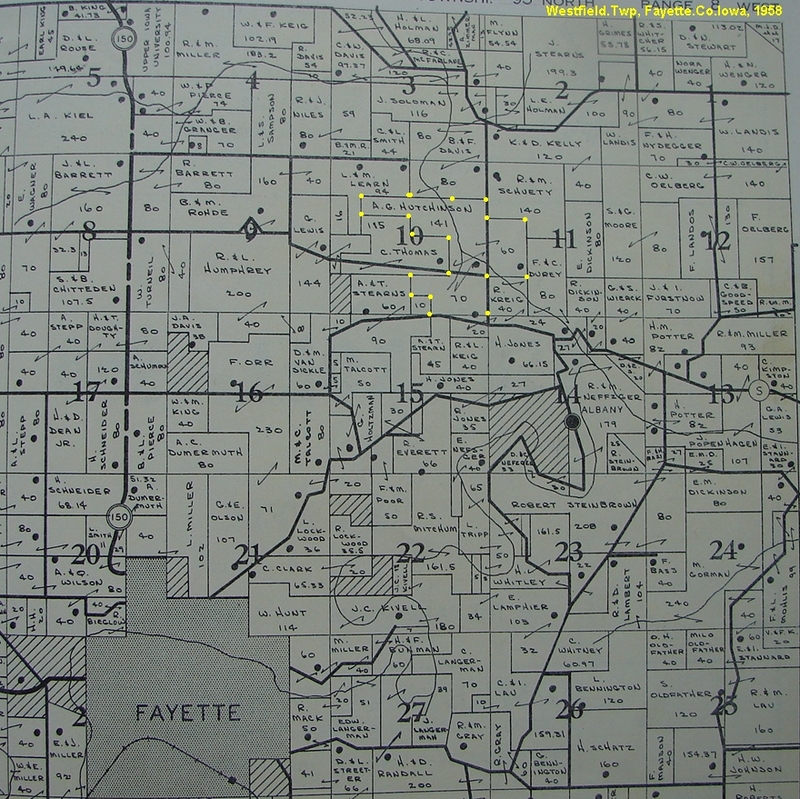 d: 1932 in Fairfield Twp, Fayette Co, IA Burial: Taylorville Cem, lot 67, NW corner, sec 23, Fairfield Twp, Fay. Co, IA. m: 30 Oct 1885 in Brush Creek, Fairfield.Twp, Fay.Co.IA Father: Isaac WALRATH Mother: Catherine ZOELLER Note 3: Burial listed 1857 as death year. bz/2006.
. 4 HUTCHISON, Janet Jennie Maria b: 15 Sep 1862 in Belleville, Wayne.Co, SE Mich. d: 09 Apr 1950 Note 4: 1890 Lived in Burlington, IA.
. 4 HUTCHISON, Byron Drake b: 11 Aug 1864 in Fairfield.Twp, Fay.Co.IA d: 1945 in Fairfield.Twp, Fay.Co.IA Burial: Taylorville Cem, Fairfield.Twp, Fay.Co.IA. Note 4: 1890 Creamery operator in Madison, Neb. .... 6 HUTCHISON, John Zina b: 17 Mar 1905 in Arlington, Fairfield.Twp, Fay.Co.IA d: 19 Apr 1990 in Taccoma, Pierce.Co.WA Note 7: 1910 Census; 5y, Fairfield.Twp, Fay.Co.IA. 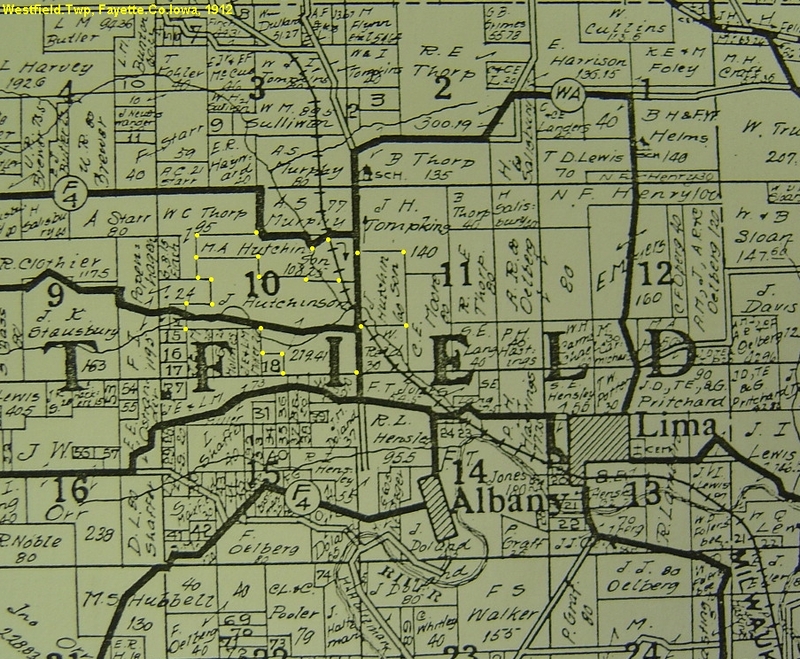 Note 8: 1915 Census; Arlington, Fairifield.Twp, Fay.Co.IA. Note 9: 1920 Census; Union, Jackson.Co.IA. Note 11: 1930 Census; Chicago, Cook.Co.IL. .... 6 HUTCHISON, Robert L. b: 18 Feb 1913 in Arlington, Fairfield.Twp, Fay.Co.IA d: 07 Nov 1988 in Arlington, Fairfield.Twp, Fay.Co.IA Burial: Taylorville Cem, Fairfield.Twp, Fay.Co.IA.
. 4 HUTCHISON, Robert Roslyn b: 07 Sep 1868 in Fairfield.Twp, Fay.Co.IA d: 28 Dec 1927 in Fay.Co.IA Note 4: 1890 Printer. 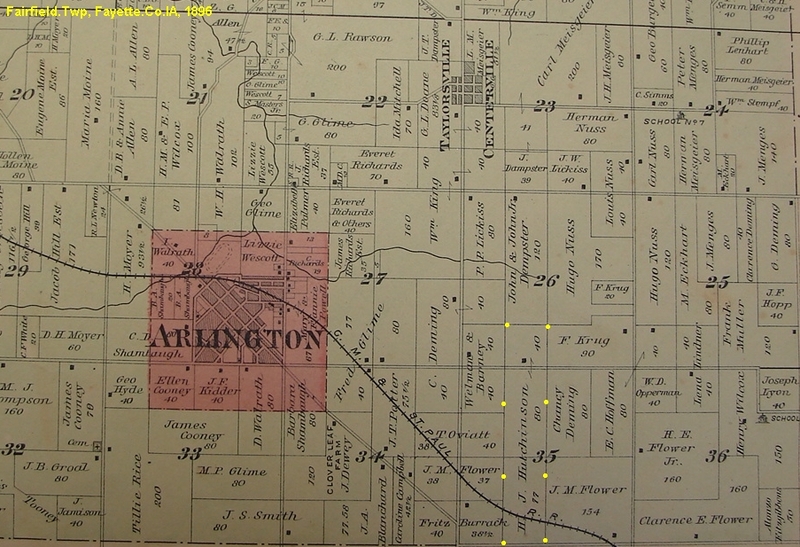 John Hutchison family of Arlington lived both in the village and on the farm just east of the Six Corners intersection in Arlington. John set up a wagon shop in the Taylorville plat before moving the shop into Arlington and then becoming a lawyer and active in County affairs. The Hutchison's of Frog Hollow were some of the most successful, long term farmers of Fayette Co, Iowa.